Not going to lie, I can retire now happy to hear Stan the Man say in this episode “I think that’s exactly right, Jason.” In this episode, Stanley Hauerwas talks with us about the John 3 lection for this coming Sunday, particularly about the problems with preaching a cliche, the trouble with satisfaction theories of the atonement, and what ‘salvation’ means. Not only did Dr. Hauerwas give us books from his vast collection, he even offered us some his classic Hauerewas humor. 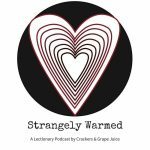 Stanley Hauerwas will be back for the next few week’s of Lent, Eric Hall will join us to close out Lent, Tony Jones will dish with us on Holy Week, and Brian Zahnd teed up for Eastertide.